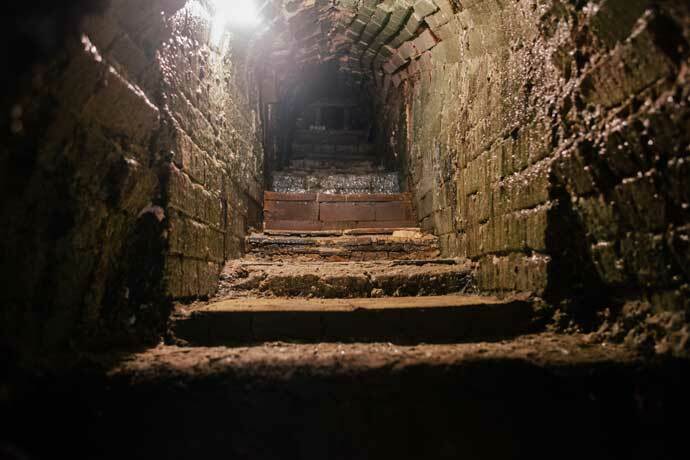 Situated below Lake Biwa in Shiga Prefecture and surrounded by the low mountains where the famous Koka Ninja mercenaries perfected their deadly skills during the Warring States period is the pottery town of Shigaraki. 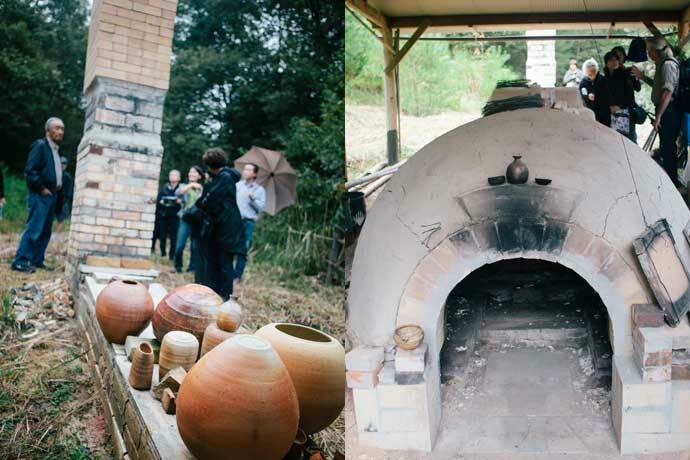 Last fall I accompanied a pottery tour group organized by Bill Geisinger and Ben Horiuchi to this sedate town where we met local potters who practice the old art of wood-firing unglazed Shigaraki pottery. Shigaraki jar by Takahashi Rakusai. The jar displays the landscape of fire color (hi-iro), scorch (koge) and burst rocks (ishihaze). The white feldspar dots protruding out of the surface of the clay are lovingly called kani-no-me (crab eyes) by enthusiasts. 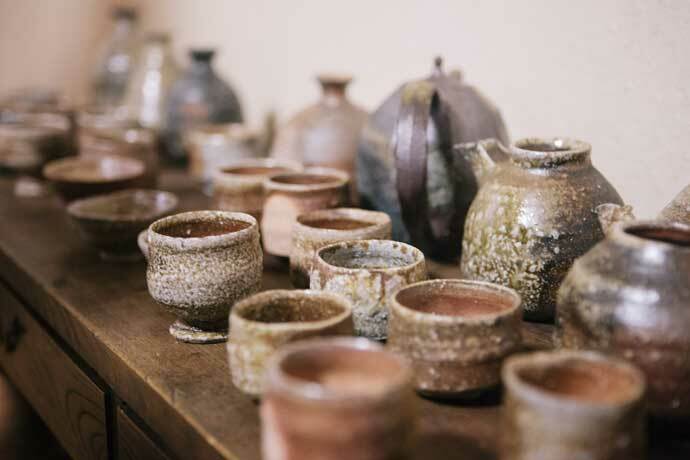 Shigaraki is one of the oldest pottery towns in Japan with a history dating back more than 1,200 years. Historians say that local kilns were producing roof tiles when the emperor Shomu briefly relocated his palace to the area from Kyoto in 742 AD. 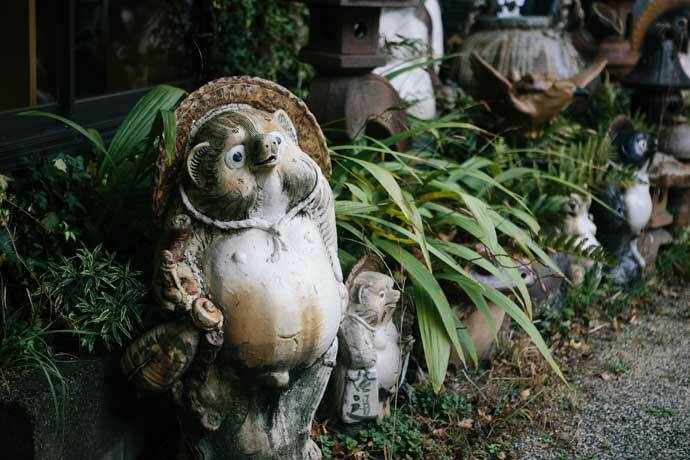 These days, many Japanese know Shigaraki for its Tanuki or Japanese raccoon dog ceramic figures that became popular after the Meiji (1868-1912) era. Shigaraki racoon dog figures are considered to be auspicious icons that bring good fortune. 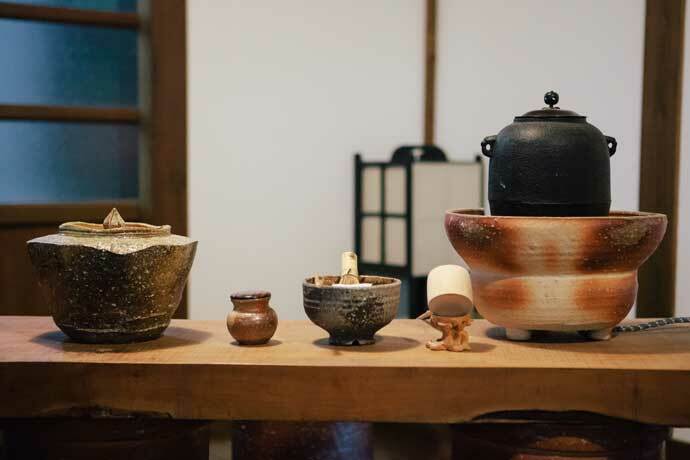 By the mid 13th century, historical accounts suggest that Shigaraki began production of simple unglazed wares with irregular colors ranging from gray to reddish orange and even black. Its distinct rough surface is due to the local clay that naturally contains numerous pieces of feldspar and silica stones of various sizes. The surface markings are achieved by a very primitive form of wood-firing kiln called Anagama. Close up of a Shigaraki vase by Kohara Yasuhiro showing the dynamic textures and colors created naturally by the clay, fire and ash. The green wash (bidoro) is achieved by the vitrified ash from pine wood used to fire the kiln. These wares, like jars and urns, were coil built and made mostly for use by farmers. In the late 16th Century, tea masters of the late Muromachi and Momoyama (1573-1603) periods deemed these simple vessels to be of exquisite beauty for their flavor of the earth or tsuchiaji. 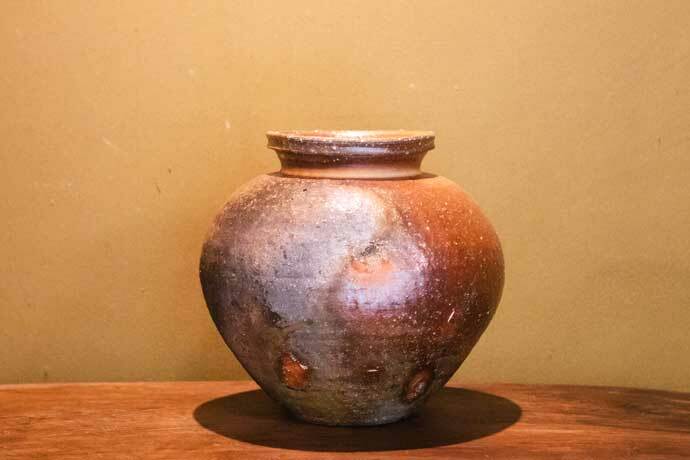 For example, the antique Shigaraki uzukumaru, small jars for storing seeds, are highly prized as flower vases. Looking at Shigaraki pottery, I feel similar emotions as when I see a weathered piece of wood, or old stones covered in beautiful moss. It reminds me of the power of nature and triggers both awe and longing to connect with its essence. 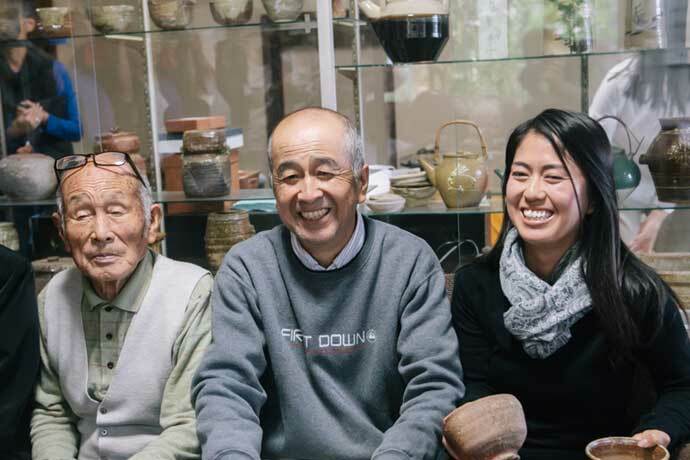 In our exploration of Shigaraki, we first visited Kohara Yasuhiro, an internationally famous potter who owns a large gallery and shop in the heart of Shigaraki town that features many local potters’ work. Kohara-san’s work combines the rough Shigaraki clay with the natural and beautiful markings from the Anagama kiln. A prime example is the green glassy pool and dragonfly eye formed by the collected pine wood ash and bright orange clay surface against the dark koge or burn marks. His work is refreshingly free and contemporary while boldly reflecting the tradition and spirit of old Shigaraki ware. Kohara-san explained that while it is often said that what happens inside a wood-fired kiln cannot be controlled, it can be anticipated through experience. His work clearly demonstrates his knowledge and expertise in the process, and potters from all over the world seek advice from him. For those lucky enough to be going to the 28th Annual North Carolina Potter’s Conference taking place next week, you will be able to meet this talented potter along with his wife Kohara Shizuko who will be giving a presentation on Shigaraki pottery on March 5. Another potter we visited was Takahashi Rakusai V, whose family has been making wares in Shigaraki for over 180 years. The Takahashi Rakusai kiln was started by Takahashi Tozaemon, who was regarded as one of the master tea ceramics makers in the late Tokugawa Shogunate era (1853-1868). But by the time that Tozaemon was active in the early to mid 19th Century, Shigaraki had already lost its leading role as a tea ceramics maker. 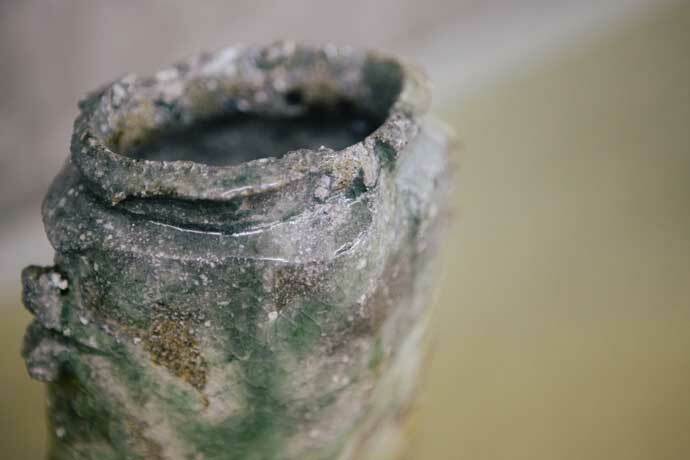 Many of its kilns were converted to the mass-production of glazed wares with processed clay that had all of the feldspar and silica particles removed. Takahashi Rakusai III took over the running of the family kiln in 1917 and sought to revive the beauty of unglazed tea ceramics made during the Momoyama period. His efforts were instrumental in beginning the gradual revival of unglazed Shigaraki pottery. Takahashi Rakusai III was designated as the Shiga Prefectural Intangible Cultural Property in 1964. The inside of the snake kiln (jagama), a type of anagama at the Takahashi Rakusai kiln. 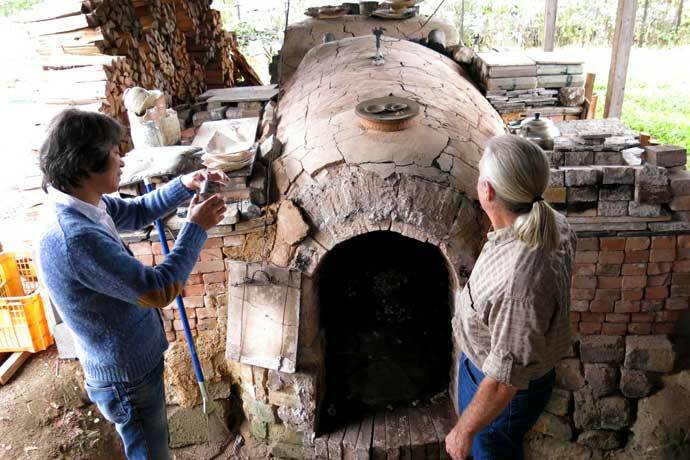 The family fires three different types of wood-fired kilns. The Takahashi family continues today to produce tea ceramics and other pots for daily use. The current Takahashi Rakusai V took over the family title in 2010 and is known for his tranquil and simple work style. He is an avid student of chaji or tea matters who had studied with the renowned tea scholar Kazue Hyonenshi, and chabana or tea flower with Kato Tansai. The three generations of potters at Takahashi Rakusai Kiln. From the left, Takahashi Rakusai IV, the current Takahashi Rakusai V and his daughter Yoshiko who is also a potter. The last potter that we visited was Arakawa Satoshi, who fell in love with Shigaraki clay and relocated from far away Yamagata prefecture. I was especially excited to meet him because I had seen his beautiful work at the contemporary Japanese ceramics exhibit at the Mingei Museum in San Diego in 2012. Shigaraki potter Arakawa Satoshi’s Anagama. In the last remodel, he increased the height of his chimney. As with many Shigaraki artist potters that fire Anagama, Arakawa-san designs and builds his own kiln. He excitedly showed us the improvements that he had made to the kiln and also the area in his backyard where some of the local clay can be found. Arakawa-san makes beautiful large jars with spectacular fire colors, that were accepted by the Japan Kogei Association for two consecutive years. He also creates lovely table wares, especially sake wares. The visit to Shigaraki made me think about the interesting evolution that old Japanese pottery towns are going through. Many, if not most of them, look to make progress by improving efficiency at the high cost of discarding their local traditions and distinctiveness. Fortunately for many pottery towns like Shigaraki, influential visionaries have fought to continue the traditional ways that are deemed essential for making beautiful work that are distinctive to their local regions. By sharing these brief stories of Kohara-san, the Takahashi family, and Arakawa-san, I hope to have piqued your curiosity into learning more about Shigaraki pottery. 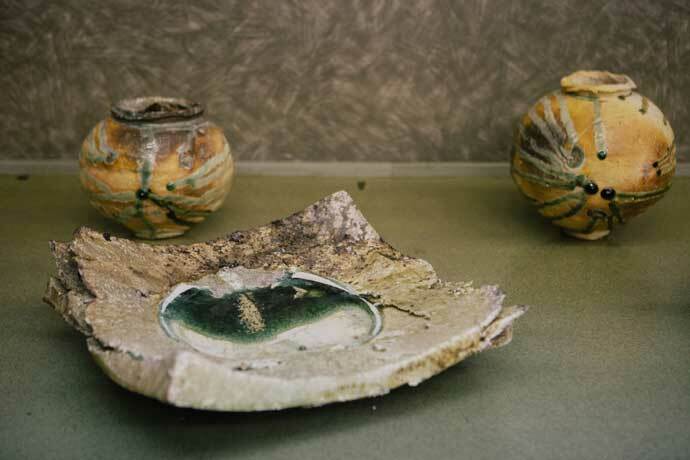 After all, our interest in Shigaraki ceramics is the best assurance for the preservation of its tradition. —>> Visit photographer Tomoko Matsubayashi’s website to see more photos of Shigaraki. Great port, Ai. I love these pieces especially the bumpy, crusty ones that seems like they’ve been buried under land or sea for 1000 years and unearthed for our enjoyment. I would need a container ship if I ever visited there. Thank you for introducing Shigaraki. I appreciate you picked up my husband Yasuhiro as an artist in Shigaraki. He is not a full-time potter but he has tried to create his ideal pieces which the Shigaraki clay looks the most beautifully. He is self-taught artist who goes for the supreme beauty of Shigaraki ceramic without any ambition for great prizes or fame. I really appreciate you gave him a chance to show his work. I shared your post on my FaceBook. Thank you very much for visiting our website and reading my blog post. It was so exciting to see Kohara-san’s work in Shigaraki last fall. His love for the local clay and passion for firing shine through in his creations! I am eager to meet you sometime in the not so distant future, maybe in your next visit to the U.S. I hope that you and Kohara-san have a good trip to North Carolina. Thank you very much for taking the time to comment. I am very grateful. The most recognizable of Shigaraki might be the tanooki (raccoon dog) ceramics commonly found as gifts and memorabilia– it’s always awesome to see near-ancient traditional ceramics remaining of interest to modern consumers. Before tanuki, the most popular item from Shigaraki was a hibachi brazier, glazed in blue! Thank you Somuch for your article! ! I am a beginner, and if I understood well they use the raku technique?!? What kind of glaze? Thank you for your comprehension ! Thank you for your comment Claudia! No, Shigaraki pottery is usually wood-fired in an anagama and the glaze is created by the ash from the burnt wood.